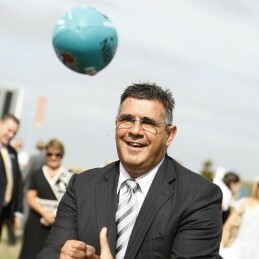 Andrew Demetriou is the retired CEO of the Australian Football League, a position he held from 2003 to 2014. The AFL is the peak body for Australian football with the national league an 18-team national competition played in Australian states and territories. The AFL is a $3.9 billion industry that boasts 790,000 amateur participants and employs nearly 12,000 people. Under his leadership the sport saw unprecedented growth, both domestically and abroad, setting records in sponsorship and broadcast agreements. He oversaw continued expansion of the sport into non-traditional AFL markets in Queensland and New South Wales with the Gold Coast Suns and Greater Western Sydney Giants awarded licences as the AFL strengthened its position as Australia’s premier game. The AFL CEO was instrumental in negotiating funding arrangements for many of the AFL’s playing venues including the Adelaide Oval, Spotless Stadium in New South Wales and Metricon Stadium on the Gold Coast. He was a driving force in the AFL’s community engagement programs with a strong focus on tolerance and inclusion. Before taking the reins of the AFL, Andrew oversaw all aspects of the AFL competition as the General Manager of Football Operations, a position he held for three years. Prior to this appointment he was the head of the AFL Players Association, negotiating a landmark five-year collective bargaining agreement and developing programs to benefit players during and after their playing careers including a $25 million player fund. At the conclusion of Andrew’s own 106-game league career he became the Managing Director of an acrylic teeth import business; the Ruthinium Group. He was able to expand manufacture and exports to 70 countries around the globe and continues to serve as a board member. Other commercial interest has included the position of Non-Executive Chairman of the Baxter Group, a waste management group that in 2003 was listed on the ASX with market capitalization of $40 million that was later sold for $260 million to Transpacific. Andrew is also a Non-executive Director of the non-partisan Climate Institute, a Director of sports marketing firm, The Bastion Group and the Executive Chairman of Acquire Learning, a Victorian company linking students to training providers. Andrew has also previously held the role of chairman of the Australian Multicultural Advisory Council.